Theatre curtains have become integral to the theatre. Performances are punctuated by the opening and closing, or rise and fall of the curtain, which can lend a sense of suspense, mystery and drama to any production. 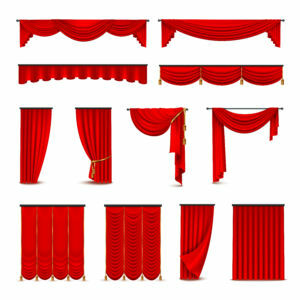 There are different types of theatre curtains and they go by various names: the grand drape, main drape, house curtain and sometimes it’s affectionately referred to as the ‘main rag’. This attractive element of the theatre draws the eye to the stage, creating a focal point, but the purpose of the front of house curtain is not merely aesthetic. It serves another important role: acting as an acoustic barrier. Using heavy materials such as velvet and theatre wool means that a stage curtain can double up as an extremely effective acoustic curtain, as well as creating an opulent appearance. Teasers and tormentors are moveable or fixed curtains that allow the proscenium arch or opening to be resized, reduced or reshaped. The proscenium arch is a fixed architectural feature that acts like a picture frame through which the on-stage action can be seen. Sometimes certain productions and scenes will call for the dimensions of the proscenium arch to be altered, and this is where teasers and tormentors come into play. The teaser is the horizontal curtain that is hung behind the front of house curtain and upstage of the proscenium arch, and it can reduce the height of the arch. These are usually attached to travellers on the stage track and hung using battens. The tormentors are the vertical elements, and can be vertical stage curtains or masks. Much like teaser curtains, these also run on stage track and are hung on battens. They are also mounted downstage of additional borders or ‘legs’, and are located upstage of the front of house curtain. Legs, borders and tabs are theatre curtains that generally serve a similar purpose to teasers and tormentors, only they are most commonly used to hide technical equipment. Thick fabric curtains can also be as a very cost-effective and efficient way to divide a large room, such as a multipurpose space, gymnasium or auditorium. Room divider curtains can have very favourable acoustic absorption properties helping to minimise echo and reverberation when there are a lot of people or activities in the venue. Keep in mind that any stage curtains should be flame retardant and conform to Australian standards, and any tracks or runners should be installed by an experienced technician and regularly maintained.